The Enid A. Haupt Conservatory in the New York Botanical Garden (NYBG) will undergo a $17.7m renovation this year to restore its “palm dome”, one of the 11 biomes of the historic greenhouse, and refurbish two adjacent galleries that feature lowland rainforest plants and special exhibitions. While some of the more sensitive specimens in the 1902 Victorian-style conservatory will be transplanted to temporary homes, most of the plants in the palm dome will be safeguarded under an enclosed weather-proof barrier that will keep the plants properly climatised–a departure from previous renovations in which most of the botanical collection was transplanted elsewhere. During the renovation, visitors will be able to view 360-degree images of the palm dome via an interactive mobile application produced in partnership with Bloomberg Philanthropies. While most of the 55,000-sq.-ft building will remain open, the palm dome and the two galleries will be closed from 29 April to 31 May 2020. The NYBG plans to stage its 2019 exhibition, a retrospective devoted to the Brazilian Modernist landscape architect Roberto Burle Marx, in alternative sites throughout the garden. The structure has faced some serious conservation challenges over the years. In the late 1970s, the building was so dilapidated that it was at risk of being demolished. It had been renovated in 1935 and 1950, but warm-climate plants, such as the palms, cycads, ferns and other specimens within the palm dome, demand high temperatures and humidity, which causes the building to expand, contract and rust. 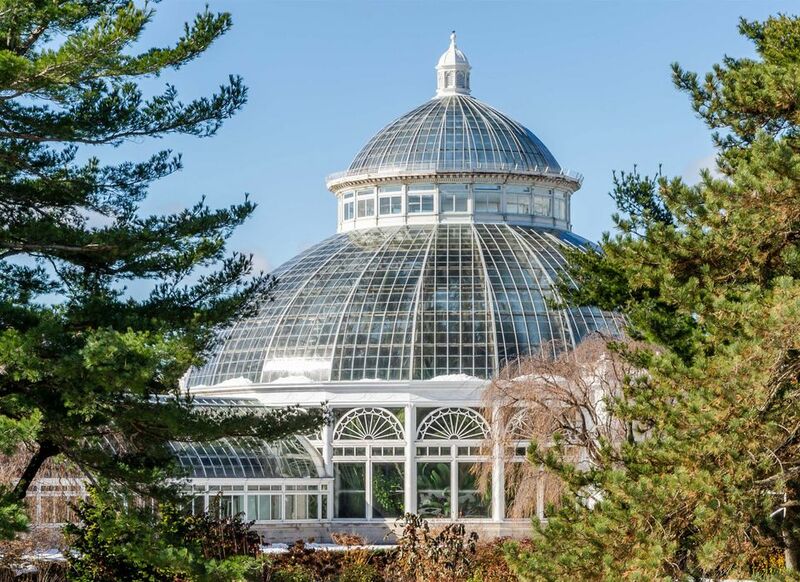 In 1978, the philanthropist and former Seventeen magazine publisher, Enid Annenberg Haupt gave the NYBG $5m (capping a previous donation of $850,000 in 1976) to save the conservatory from being knocked down. But that initial restoration addressed mostly superficial issues. Another $21m renovation took place between 1993 and 1997. In 1994, an engineer working on the project told The New York Times that the conservatory, made of thousands of glass panes and steel grids, was a “low-performance structure” that was unsuitable for housing the more than 2,000 species of exotic plants that live there. But, the structure endured. “Renovations are always massively complex”, says Todd Forrest, the NYBG’s Arthur Ross vice president for horticulture and living collections, who is overseeing the current conservation project. He adds, “The conservatory is really a living machine—it’s much more than a building—and that requires a great amount of coordination between the horticulture and architectural departments, and routine maintenance”. He adds, “We have a historic building—a New York City landmark—that is made from thin layers of glass and steel that is meant to create an environment for plants that aren’t from here. But, beyond thinking about construction, we also need to keep these plants—some of them that are grandmothers and grandfathers—alive and healthy”. Jan Hird Pokorny Associates and Silman Structural Engineers are leading the project, which is being supported by the LuEsther T. Mertz Charitable Trust and the state and city of New York.